200 years and more, this particular farmhouse will probably be old. Hardly ever will it be possible for a guest, as in this house, to experience the tradition and history of a valley while still experiencing the small advantages of modern life. As soon as you take the winding road from Lana (5 km from Merano) to Ultental, you will arrive in about 15 minutes. Once parked, a short forest path (3 minutes) leads to a farmhouse from the time of our folk hero Andreas Hofer and the Napoleonic Wars. Hidden in the middle of the forest, it sits enthroned on a rock - knottn, as it is called in this country - the Knottn-Hüttl. This house needs this special love for tradition and history and a mixture of the joy of discovery and the need for independence. Somehow, everyone who enters the house feels transported back to another time. Much is reminiscent of an erstwhile, simple existence, of origin and culture, while others are enchanted by the special flair that so many luxury hotels and restaurants in their own ambience try to keep alive, by installing old wooden beams, tables or entire lounges. Here in Knottn-Hüttl it is exactly the opposite. Everything is original, with only a few modern touches to make your stay comfortable. The kitchen is equipped with a well-functioning wood stove. Cooking on wood fire will surprise you, the taste develops uniquely. But of course, a simple, modern electric range offers the faster alternative. The kitchen has fridge and oven, but no dishwasher. An original built-in farmer's oven astonishes nostalgics. On the lower floor there is a living room and the heart of the house: the original Ultner Bauernstube. The wood stove offers a cozy warmth on cold days. Even a little nap on the stove bench will be an unforgettable experience. On the ground floor, accessible from outside, is the bathing room, with toilet, sink and shower. An old, narrow wooden staircase leads to the upper floor. 3 bedrooms can accommodate 6 people. A pull-out couch can again provide a place to sleep in the living room. On the upper floor there is now a 2. Bathrooms, although in the rooms water jugs and wash basins from the last century nostalgically remind of bygone times. The covered "loggia" in front of the kitchen entrance, the terrace, with large sunbathing area and the balcony. The water, they will receive it from the in-house source, requires special attention. A variety of sources in South Tyrol is said to have a healing effect. 32 mineral springs are recognized by decision of the regional government. Including Bad Lad and Mitterbad in St. Pankraz. These sources have been selected from a long series that has been used since ancient times for peasant baths and sanatoriums. Already in Sissi's time, the Ultner Badlen achieved their reputation in view of the special healing power. The healing water of the St. Pankraz and St. Walburg lying baths Mitterbad, bath Lad, Lotterbad and over water was used to drinking cures and for baths very successfully. In addition to Empress Sissi, Otto von Bismarck, the painter Franz Defregger and the writer brothers Thomas and Heinrich Mann also enjoyed long stays in the quiet, restful Ulten Badlen.The water of Bad Lad was formerly mainly used for baths against z. B. Anxiety addiction, rheumatism, gynecological disorders, blood disorders, injuries, indigestion, anemia, skin diseases, weaknesses recommended and relieved nervous disorders. In 2010 it was analytically proven that the water is bacteriologically pure. Our in-house spring is located in the same place and area of ​​the recognized spa bath Bad Lad. St. Pankraz / Bad Lad is the ideal starting point for a variety of activities. In just 15 minutes you reach the lift to the most rustic alpine area in South Tyrol: the Schwemmalm. It is known for its beautiful huts serving traditional Ultner dishes. If it is a family-friendly hiking area in summer, sports enthusiasts enjoy the snow-sure toboggan and ski area in winter. But even if you want to start directly on foot from the house without a car, there are hiking opportunities. The village center of St. Pankraz can be reached in 30 minutes on foot. 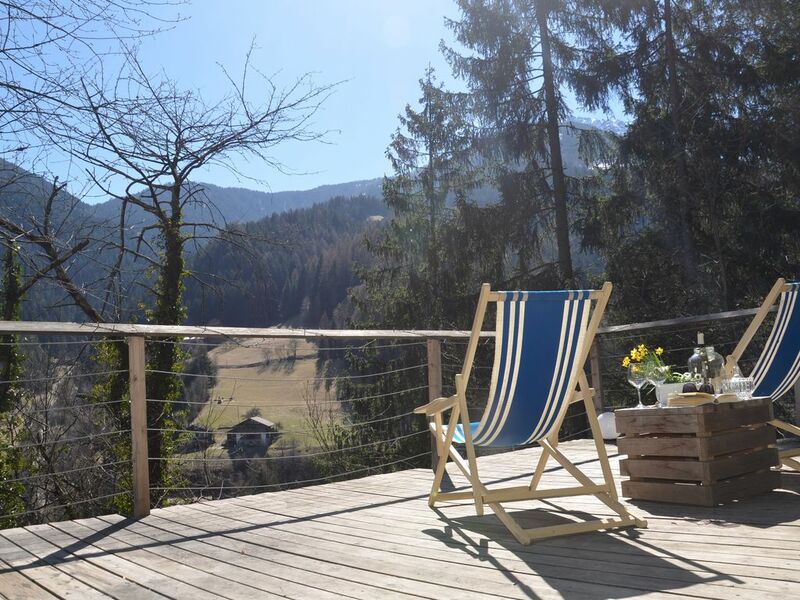 And if you are looking for city life, events of all kinds, restaurants and shopping possibilities, you will be in 10-15 km in the Burggrafenamt and thus in Lana, Meran and surroundings. CLEANING FEE PER STAY 95 Euro IN SUMMER, 125 € IN WINTER AND HEATING PERIOD. Likewise, the tax of 1.50 / guest / night. These charges will be calculated upon arrival. Hallo, unsere Erfahrung war sehr positiv. Das Haus ist ein spektakuläres altes Berghaus sehr charakteristisch und für diejenigen, die Natur und lokale Tradition lieben. Ein Aufenthalt, um es zu empfehlen! Sehr schöne, liebevoll restaurierte Hütte, ausgestattet mit allem was man braucht. Wir haben dort wunderschöne Tage verbracht. Vielen Dank. Die Hütte ist so liebevoll und umsichtig gerichtet worden, dass es fast eine Zeitreise ist, dort zu wohnen. Aber eben nur fast: Alles, was man braucht, ist da. Es war ein ganz wunderbarer Ort. eine unglaublich hübsche Hütte, perfekt zum einfach Sein. wir haben unser Wochenende genossen. Die Hütte ist liebevoll und gemütlich eingerichtet und die Gastgeber sind unkompliziert und sehr freundlich.